Every homeowner is aware that flooding causes significant damage but many do not understand just what their risk is of experiencing flooding. Floods can happen anywhere, not just in coastal areas or low lands, and it only takes a few inches of water to cause serious damage. Indoor flooding is also a major health hazard as the water may contain harmful microorganisms and create the right conditions for mold or mildew. By understanding these flood facts, you can effectively prepare for a flood and take the right actions if one occurs to limit the damage. A flood or flash flood can happen in all 50 states in the U.S. There are many possible natural causes of flooding such as heavy rain, melting snow, flash floods, hurricanes, tropical storms, land development, and broken dams. Everywhere is a flood zone because where there is water, there can be flooding. The most common natural disaster in the U.S. is flooding. 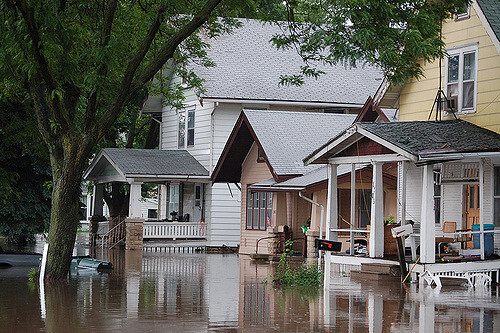 For the past 30 years, flooding has resulted in almost $8 billion in damage each year. Floods cause an average of 82 deaths per year, making it the deadliest weather related disaster in the U.S.
Land development and construction including new buildings and roads makes an area more vulnerable to flooding because it takes away land that would naturally absorb the water. Deserts can experience flooding because the hard soil cannot absorb rain water, leading to flash floods. Standing flood water could be electrically charged and very dangerous if there are downed power lines. Flood water may consist of sewage, harmful microorganisms, sharp objects, and other debris which makes it a danger to your health. You should never walk or swim in flood water. It only takes six inches of moving flood water to knock you down. It only takes two feet of moving water to carry your car away. Flash floods can have 10 to 15-foot-high walls of water. Flood insurance policies can take 30 days before they take effect. The National Flood Insurance Program (NFIP) warns that just 1 inch of water can result in over $10,000 worth of damage. You can check the flooding risk in your area with flood hazard maps. If your home is in a high-risk area, there is a 1 in 4 chance you will experience flooding over the period of a 30-year mortgage. Areas that are not high-risk flood zones are responsible for over 20 percent of National Flood Insurance Program claims and one-third of federal disaster assistance. The facts and resources listed above should provide you with enough information to adequately prepare for flooding and react effectively to flood damage. Remember, indoor flooding causes widespread damage very quickly so do not hesitate to contact a professional for water damage restoration. These professionals will stop the spread of the water and handle the entire flood damage cleanup.